This small park predominantly used for its recreational fields, basketball courts, and playground offers a stone dust walking path that follows portions of the perimeter of the fields. The pleasant surprise here are the trails that are in the nearby woods that lead to and partially around Laportes Pond. The trails here are short offering several large outcrops and views of the pond. Do keep in mind that some of the trails lead of the parks property into a nearby gun club. Take heed of the “No Trespassing” signs along the trails. Fairly easy with some steep hills. The Lincoln Greenway connects three town properties, Chase Farm, Lonsdale Park, and Gateway Park. The blazing system of red squares (to Gateway Park), yellow triangles (to Chase Farm), and green circles (to Lonsdale Park) is simple to follow. For this hike, led for the Blackstone Heritage Corridor, we started at Gateway Park by the historic Arnold House. After a short loop within Gateway Park on the paved paths we made our way to the northwestern corner of the park to the yellow blazed trail that leads up a steep hill. The trail soon comes to a residential neighborhood where we crossed a street. From here we continued along the trail on the opposite side of the road. The Greenway now enters into Lonsdale Park which is a wooded area behind the Lonsdale School. Continuing to follow the yellow blazes we soon came out the open fields of Chase Farm. We turned to the left and follow the perimeter of the farm following a grass mowed path. It soon came to a pond which we made our way around before turning to the left and then right following the perimeter of a large field once again. Soon we were back at the trail that leads back into Lonsdale Park. From here we retraced our steps back to Gateway Park this time following the red blazes. Moderate due to terrain, navigation can be difficult. A few quick notes about this hike. Lincoln Woods is notorious for having many unmarked trails that one could easily get lost on. It is highly recommendable that you use a GPS device if you choose to embark on this hike. Although I tried to keep it as easy as possible (as far as navigation) I think improvements can be made. Some of this hike is road walking and I do believe there are other trails that can eliminate that. I fully intend on returning to this area of Lincoln Woods to explore further and finalize a route. This hike starts at the dam at the eastern end of Olney Pond in Lincoln Woods. There is a parking area suitable for about 15 cars. At the north end of the parking lot is the Jodi Lussier Memorial. Pass the rock and veer left to the right of large outcrop onto a trail that leads into a small valley. Stay to the left and follow the wider trail that approaches the pond. To the right just before the pond is a trail to the right that climbs uphill. At the top of the hill you will encounter your first experience of multiple trails to choose from. For this hike, stay to the left to parallel the pond. The trail soon dips close to the shore and is marked with red squares. The trail winds, with the pond to left and a hill with boulders on right, up and over small hills following the red square blazes. Along the way there are several spots to view pond. Ahead the trail splits. The trail to the right comes out to an old woods road that you will be on later. For now stay close to the pond. The key is to continue ahead taking lefts to continue to parallel the pond. By doing so you will turn onto a peninsula onto a trail that leads out to Sunset Point. The trail turns to the right, still following the shore, around the point and up to a rock outcrop that overlooks the pond. From here continue to follow the trails along the ponds edge and it will come back to the old woods road. Turn left here and follow the road downhill, again continuing to follow the shore. The aptly named Boulderwood Cove is now on your left. To be sure you are where you should be, you should see a single boulder emerging from the water at this point. Ahead is another multiple trail intersection. Turn left and the trail almost immediately splits. Stay to the left again following the path by the shore once again. Another split is ahead, again stay to the left. Continuing straight ahead there are a couple spur trails to the right you will ignore. Soon you will pass a large balancing boulder on the right. Continue straight ahead following the most defined trail until you reach a flat area surrounding you with large rocks. Here the trail splits again. This time stay slightly to the right (straight) and up the small hill. This trail and another merge at the top of the hill. Stay to left towards the massive boulders. Continuing ahead the trail you are on merges with another. Continue ahead to road passing through picnic site 59. Across the road is picnic site 27. To the left of the site is the trail that scrambles uphill. Cross the road and follow this trail uphill to another massive ledge. Stay to the left of the large rock and follow the base of it to the other side. Continuing the trail narrows and continues straight ahead following faded green dots. Soon the trail abruptly turns left down a rock outcrop into a small valley and crosses a stream. The trail narrows even further, then takes sharp right at a large boulder. Follow the face of the boulder, the trail turns slightly left and then continues straight to Quinsicket Road. Turn right follow road passing picnic sites 29 through 32 on the right. On the left you will notice signs indicating that the trails are used by horse back riders. Follow the paved road up and over a significant hill. As the road starts to climb up again it bends to the left. There is a parking area on the right. Turn right here through the parking area toward row of concrete blocks and rocks that block the old woods road. Grass covered at first, and blazed blue, this trail heads east. To the right is the top of Tablerock Hill. The trail then starts to descend and becomes quite rocky. At the next split the blue blazes stay to left. Here you want to stay to the right and go downhill. The next intersection, at the bottom of the hill, turn right and follow dirt road that leads to picnic sites 2 and 3. Continuing pass the picnic sites you will soon turn right onto the road that wraps around a large field on the left. On the right is the entrance of picnic site 4. At the back of the site is a large ledge with an inscription in it about Bobby Donato, a local, who served in the United States Marines. Retracing you steps back to the road. Continue to the entrance of picnic site 5. Here at the sites entrance is a large outcrop known as Pulpit Rock. It is said that Metacom, a Wampanoag leader, would address his warriors here. Just beyond the picnic site are two trails. For this hike take the one to the left. It passes a small quarry on the left and a small pond on the right before it starts climbing uphill with a stone wall on the left. The trails soon come together, stay to the left here on the more defined trail. This trail continues to climb uphill and soon bends to the right. Ignore the trail to the left and continue another 30 feet or so to the next trail intersection. It is here you will turn left and follow the trail passing a boulder on your right. Continue straight, staying to the left trail downhill as it traverses over an outcrop and then soon a wooden bridge over a stream. To your left are picnic sites 10 and 11 and Goat Rock. For this hike continue straight. The trail here is a wide dirt path that also passes picnic sites 13 and 14 again on your left. Continue straight to the next intersection then veer to left. This trail leads you to the backside of some more picnic sites. Stay on the trail as it bends to the right up and over one last hill. At the top of the hill you will see the road ahead. This trail ends at the road intersection, cross the road and continue straight. You are now on Stump Hill Road and your car is ahead on the right. Trail map can be found at: Tablerock Hill. Inscription In Donato Rock at Lincoln Woods. Moderate to difficult due to navigation, otherwise fairly easy. Lincoln Woods State Park is a sprawling property with miles and miles of unmarked trails. Most people that come here to walk do the loop trail around Olney Pond. But for the more adventurous there are places to see that most wouldn’t. Barney Pond, to most, is accessible along Smithfield Avenue in Lincoln. There is a small bridge and parking area here by the dam that creates the pond. On the opposite side is a series of trails that most people are not aware of. For this hike we explored that lesser known shore and other highlights of Lincoln Woods. Starting from a parking area at the baseball fields, we made our way down the road back towards the entrance and slightly downhill turning right into picnic site 5. Here at the sites entrance is a large outcrop known as Pulpit Rock. It is said that Metacom, a Wampanoag leader, would address his warriors here. Just beyond the picnic site are two trails. For this hike take the one to the left. It passes a small quarry on the left and a small pond on the right before it starts climbing uphill with a stone wall on the left. The trails soon come together, stay to the left here on the more defined trail. This trail continues to climb uphill and soon bends to the right. Ignore the trail to the left and continue another 30 feet or so to the next trail intersection. It is here you will turn left and follow the trail passing a boulder on your right. Continue straight, staying to the left trail downhill as it traverses over an outcrop and then soon a wooden bridge over a stream. After the bridge, turn left at the row of wood bollards into picnic sites 10 and 11. To the left is a massive outcrop known as Goat Rock, apparently named so because a goat once got stuck in one of its crevices. From here follow the road and stay to the left passing site 9 on the left and a large cluster of boulders on the right. Soon you will pass a gate and a wood guard rail to the right. Cross over Table Rock Road towards a large outcrop. Stay to the right of it and follow the road to picnic site 66 -80. After the road bends to the right start looking for picnic site 79 which is setback off the road. Cross through the picnic site to a trail at the back end of it. From this point forward navigation becomes difficult in areas. If you are not overly adventurous and/or do not have a good sense of direction you may reconsider this portion of the hike. GPS is also highly recommendable from this point forward. From the back of the picnic site follow the less define leaf covered trail slightly downhill away from the site. After a short distance turn left onto a trail that has been partially washed out. This trail looks like an old cartpath from yesteryear. It is obvious that people still use the trail but it is also obvious that it is not many people. The trail at times become very narrow, almost to the point of non-existence. Along this stretch we encountered deer. After going downhill for a bit the trail finally widens as you catch a glimpse of Threadmill Brook down in a valley to the right. Continuing straight and downhill, you will soon pass a trail on the left. Keep going straight passing a formation of stones in the trail that are obviously manmade. Ahead you will catch your first glimpse of Barney Pond. The main trail bends to the right here following the shore to a small bridge that crosses Threadmill Brook. Beyond the bridge is private property. For this hike, as the trail approaches the pond you want to turn to the left following the shore. You will soon find a narrow trail that parallels the west shore of the pond. The trail heads in a generally northerly direction and can be quite overgrown in areas, but it offers a few areas that overlook the pond. We were greeted by ducks and swans at one of these spots. Barney Pond is a manmade pond created when the Moshassuck River was dammed at Smithfield Avenue. The pond is about 25 acres and used primarily for fishing and kayaking. After passing a makeshift log “road” and a stone wall the trail widens as it enters a canopy of the woods. There is a homemade dock at a peninsula. From here the trail continues north into an area of Japanese Knotweed. In the height of summer the trail can vanish, quite literally. If the trail has been used recently you should be able to make your way through the broken knotweed. If not, your other choices are to retrace your steps or follow a faint trail from the homemade dock in a westerly/southwesterly direction up the hill where you should find a cartpath. That cartpath will lead you back to the trail that runs along Threadmill Brook. Either way, be sure to use GPS. For this hike, continue following the trail through the knotweed. It soon comes to the northern reaches of the pond, now slightly off into the distance to the right. This trail soon comes to Table Rock Road. If you have come this far, congratulations, well done! Turn right and follow the road to the shack. Here you will see the iconic Lincoln Woods covered bridge. Turn left onto the road to the baseball fields. Soon you will come to where your vehicle is parked. Again, this hike is only suggested for those who are comfortable being in the woods, adventurous and/or have a good sense of direction. The Blackstone River Byway is a utility road that follows the eastern shore of the Blackstone River in Cumberland just north of Albion Road. Between that road and the river is a short footpath of a trail that climbs up to an impressive outcrop of rocks that overlook the river. The trail is entirely in Cumberland but you must park at the bike path parking area just over the river in Lincoln. From the parking area follow School Street over the bridge that crosses the river. From here you will get a great view of the Albion Dam. Just after the bridge and before the gated road is a narrow footpath that heads north along the river. The path passes the dam before heading uphill to the overlook. This is a great little spot to sit and contemplate. This hike out and back (and for this hike description featuring just about all the highlights) is about a half mile. If you choose to further explore, follow any of the spur trails to the Byway road and head north. The utility road is heavily traveled by ATV’s and not so much utilized by hikers. The road follows a buried petroleum pipeline for a distance before pipeline crosses the river. You will see a clearing on the left with a sign down below warning of the pipeline crossing the river. A hike to this point (and back to the parking area) is just about 2 miles. If you care do a loop of 4 miles, a fellow hiker recently explored this option. You can do so by continuing along the dirt road after it passes the utility clearing on the left. Here is a link to her website with a description and a map. Sunset Along The Blackstone From The Overlook. Lonsdale Park is one of three nearby properties that make up Lincolns Tri-Park Trail System also known as the Lincoln Greenway. There are trails through this property that lead to Chase Farm and Gateway Park using a blazing system of red squares (to Gateway Park), yellow triangles (to Chase Farm), and green circles (back to Lonsdale Park). The park itself sits behind the Lonsdale Elementary School and features little league fields and playgrounds. A pond separates the park and wooded area that features the trails. Start from the parking lot on the side of the school and follow the paved path to the left of the baseball field. Soon you will see the actual trailhead. For this hike, I first followed the yellow blazes to Chase Farm. I then followed the red blazes until I reached Bernon Drive. From here I retraced my steps a bit and then followed the green blazes back to Lonsdale Park. The property has some rather significant hills, stone walls, footbridges, and streams. A hike of longer distance can be achieved by utilizing all three properties. Trail map can be found at: Lonsdale Park. This walk follows the southern most portion of the Blackstone River Bike Path into Cumberland. Starting at the parking area at the old Lonsdale Drive-In I followed the bike path south to John Street. 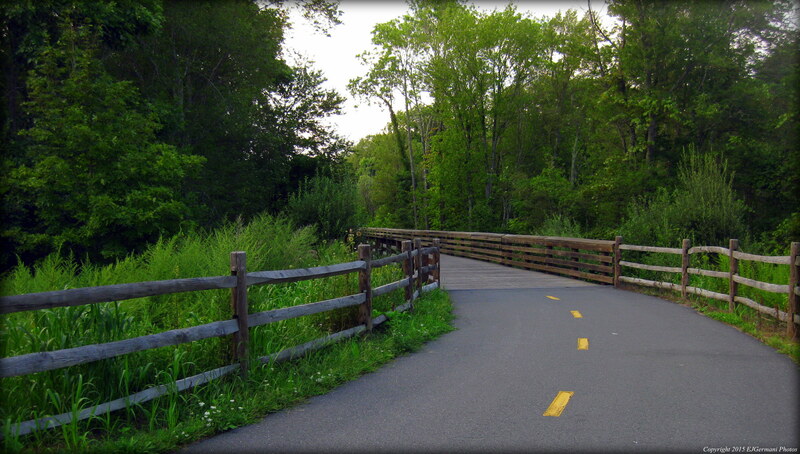 The bike path crosses over the Blackstone River into Cumberland, then crosses Route 123. The remainder of the bike path follows the edge of the marsh and consists of a paved path and an area of boardwalk. After the boardwalk there is a trail to the right. The trail is narrow and overgrown in areas. The trail will bring you to the rivers edge. By walking to the end of the bike path and back and also following the trail you can achieve a little over a mile and a half. Trail map can be found at: Lonsdale Marsh.